Jaromir Jagr craves a display of the Rangers’ affection for him. General manager Glen Sather says he is a fan but has yet to reach out to personally convey that sentiment to the sensitive captain. So, with only 20 days remaining until Jagr can become an unrestricted free agent, it is anybody’s guess whether he’ll be in a Broadway Blueshirt when the club opens next season in his native Czech Republic. And because Jagr’s return or departure is the first domino that needs to fall before the Rangers can continue the process of assembling their roster for next season, such uncertainty at such a late date can’t be viewed as a good thing. Of course, Sather has always enjoyed playing the cat-and-mouse game when his top players’ contracts come up for renewal. So his unhurried approach with Jagr is hardly out of character. As long as Jagr’s situation remains not just unresolved but completely unpredictable, it seems difficult for the Rangers to make decisions regarding other potential unrestricted free agents, such as Sean Avery, Martin Straka and Michal Rozsival. Season Highlight: Two springs after being battered by the rival Devils, the Rangers avenged that 2006 first-round sweep by eliminating New Jersey in five games in the 2008 first round. Lundqvist outplayed living legend Martin Brodeur—who was tormented by Avery shift after shift—and Jagr was a monster en route to leading the playoffs in scoring through two rounds. Turning Point: A quirk in the schedule—back-to-back home games against an Atlanta team they own—produced 4-0 and 2-1 Garden victories (the second on the night Brian Leetch’s No. 2 was retired) to catalyze a playoffs-making 20-6-7 stretch run. Lundqvist was brilliant throughout the 11-week surge. Jagr routinely dominated games. And the Rangers capped a season in which they went an Atlantic-best 20-7-5 within the division by going 5-1-4 in their last 11 games, which all were intradivisional. 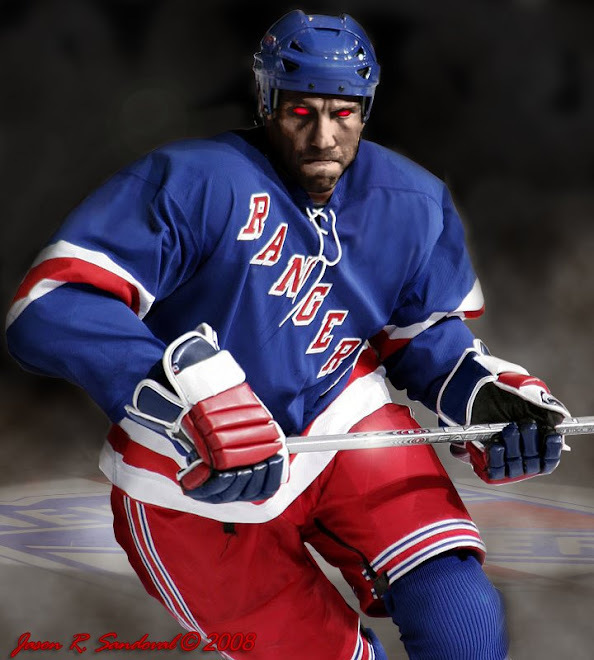 • While Sean Avery remains in the news because his publicists have passed along word of every move he’s made as an intern at Vogue magazine this summer, his contract negotiations with the Rangers have yet to produce anything of interest. Avery remains convinced that he is a top-six forward who should be paid in the neighborhood of $4 million a year. The Rangers have yet to budge off their early season offer of $2.75 million per. Most Valuable Player: G Henrik Lundqvist battled through the most difficult of his three NHL seasons to lead the NHL in shutouts (10), finish fourth in wins (37) and sixth in goals-against average (2.23) and earn a third straight designation as a Vezina Trophy Finalist. Lundqvist was distracted midway through the season by worry about his father, who underwent emergency surgery in Sweden for a brain aneurysm, and had to fight to rediscover his form for the stretch run and playoffs. Most Disappointing Player: Unable to develop on-ice chemistry with either C Scott Gomez or C Chris Drury, Rangers captain Jaromir Jagr went from averaging 110 points his first two seasons in New York to scoring a career-low 71. However, despite failing to approach the great expectations that are standard for him, Jagr mentored rookie C Brandon Dubinsky to a fine first NHL season. Biggest Needs: The Rangers’ first order of business is to figure out whether RW Jaromir Jagr is coming back. Then they can deal with their free agents and work on improving their defense. Free Agent Focus: The Rangers remain committed to upgrading their underwhelming defense corps—by adding offensive ability and/or physicality. And while finding a scoring winger who can skate with C Scott Gomez will have them at least expressing an interest in Marian Hossa, it remains unlikely that the Rangers will shell out the at least $7 million per he is expected to command on the open market. • D Michal Rozsival, whose play dropped off over the season’s second half and in the playoffs, was to undergo surgery to repair a torn labrum muscle in his hip June 11. Though Rozsival scored a career-high 13 goals this past season, none came after Feb. 3. And the Rangers are considering whether to re-sign him—he’s likely to command at least $4 million per on the open market—or look elsewhere to upgrade the top end of their defense corps. • LW Martin Straka is nearing the time when he must decide whether to sign on with a team in his native Czech Republic and effectively end his NHL career. Straka said last week that he is struggling with the decision, and it is unclear whether the Rangers want the classy, 35-year-old veteran back. • RW Brendan Shanahan’s return for a 21st NHL season remains uncertain. The venerable winger, who turned 39 in January, sagged badly over the second half of the season. He blamed the effects of failing to give himself enough time to recover from a Jan. 5 collision with Dustin Penner that left him with a sprained knee and led to hip and back problems. An update...Perry Pearn missed out on the Panthers job. The cats chose Kitchener Rangers coach Peter DeBoer instead. anonymous...thanks for the update. I took it out entirely, as it wasn't really that relevant to the piece as a whole. Looks like Avery is maybe going back to the LA Kings to get his 4 million. If he were to join Ted Nolen and those Island People, it would be one of the greatest nemesis stories for Rangers fans in years....just like Dennis Potvin, Sean Avery would have chants in his name. Can you imagine Avery instigating Henrik Lundqvist? Fantastic!!!! Rumors are swirling, but Glen Sather has stated publicly that he will have discussions with Jagr and Shanahan before July 1 and WILL NOT have discussions with Sean Avery and Michal Rozsival before July 1.